QHYOAG-S is the thin and solid off axis guider. The QHYOAG-S body thickness is just 10mm and in the packages comes with M42 thread adapters with 3mm thickness, so the total thickness is only 13mm. 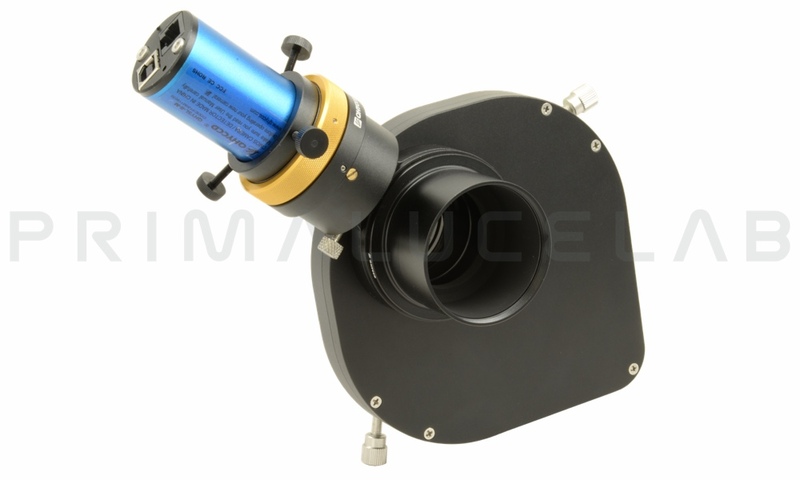 Thanks to 6 M3 through hole in the OAG, you can directly connect it to the QHYCFW2-S 6x31,8mm motorized USB filter wheel or to the, QHYCCD "A" series camera directly. QHYOAG-S comes with a 31.8mm micro focuser to properly focus the guide camera independently of the imaging camera and a 8 x 8mm prism size. QHYOAG-S has 38mm free aperture. QHYCCD QHYOAG-S off axis guider connected to QHYCCD QHYCFW2-S 6x31,8mm motorized USB filter wheel.